Campfires are a great place to spend time with people. They’re also known to be a great place to tell stories. Some of them tall and others true. This is a true story about an evening by the campfire. 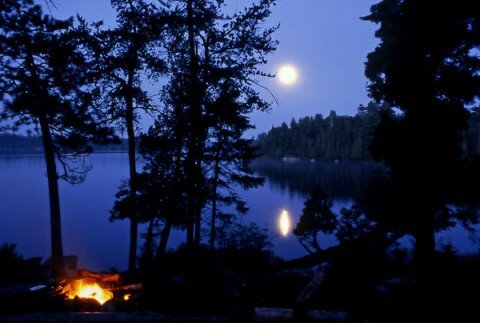 We spent many hours near the campfire by the lake when my husband, Tim, was courting me. The flickering flames were hypnotizing and soothing and provided a great atmosphere to relax and get to know each other better. After we had each introduced these people who had meant so much to each of us, a soft, ephemeral breeze swirled around us as if to caress us as it passed. It briefly fanned the flames on the fire and licked at the leaves on the trees, then left as quickly as it had arrived – leaving us once again in the calm of the full moon evening. We were both deeply and literally “touched” by the breeze. It still gives us goosebumps to even talk about the experience to this day. Was it a caress from our loved ones who had “climbed the garden wall and bloomed on the other side?” Were they somehow reaching out to thank us for remembering them on this beautiful night by the campfire and lake of glass? Those of us on this side of the garden wall will have to wonder about seemingly spiritual events such as this. Perhaps when we cross over that wall, we will know the answers to questions like these.